Most jobs in developing countries (DCs) are found in the informal economy which plays a predominant role within the economy. Better understanding how the economies of these countries work thus requires a better knowledge of the informal sector. This knowledge is also indispensable in the fight against poverty which is at the heart of political development preoccupations. Understanding the informal sector is of utmost importance from a political, economic and social point of view. In spite of the efforts made in this domain by the International Labour Organisation (ILO) over the last decades, the vagueness which continues to surround the informal economy remains a big obstacle which prevents its being taken into account in economic policies. 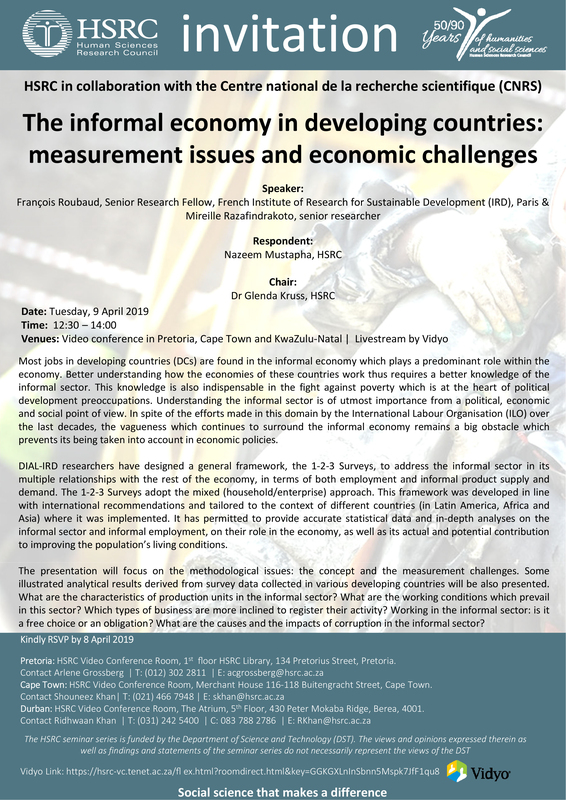 DIAL-IRD researchers have designed a general framework, the 1-2-3 Surveys, to address the informal sector in its multiple relationships with the rest of the economy, in terms of both employment and informal product supply and demand. The 1-2-3 Surveys adopt the mixed (household/enterprise) approach. This framework was developed in line with international recommendations and tailored to the context of different countries (in Latin America, Africa and Asia) where it was implemented. It has permitted to provide accurate statistical data and in-depth analyses on the informal sector and informal employment, on their role in the economy, as well as its actual and potential contribution to improving the population’s living conditions. The presentation will focus on the methodological issues: the concept and the measurement challenges. Some illustrated analytical results derived from survey data collected in various developing countries will be also presented. What are the characteristics of production units in the informal sector? What are the working conditions which prevail in this sector? Which types of business are more inclined to register their activity? Working in the informal sector: is it a free choice or an obligation? What are the causes and the impacts of corruption in the informal sector?